In looking over the Progressive news from this past week I couldn’t help notice the lack of reporting on the meltdowns of the Greek and Spanish economies and backlash from their voters. What I did find was an inordinate amount of stories regarding the failed meeting of President Obama and Israeli Prime Minister Benyamin Netanyahu. It would appear that our left wing liberal friends are ignoring the fact that two large socialist western economies that’ve had the benefit of unrestrained spending are now in the tank and working on rescues with the European Union. Both are overwhelmed with debt due to “nanny state” type spending and economically moribund private sectors. Sound familiar? Of course, this is the type of model being advocated for the U.S. by left wing liberals. I thought we would focus this week on Think Progress the left blog of the Center For American Progress Action Fund think tank run by John Podesta and partially funded by George Soros. Let’s see how they covered these news items. 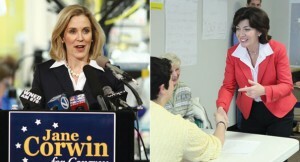 The biggest cause for left wing celebration this week was the win by Democrat Kathy Hochul of New York’s 26th district over Republican Jane Corwin. The left is celebrating this as a precursor of things to come and a referendum on the Republican budget proposal which addresses our unfunded liabilities on Medicare, Medicaid and Social Security . Never mind that democrats have yet to even present a budget. Never mind that Ms. Hochul won by a plurality (47%) and not a majority and received only 1% more of the vote than Barack Obama did in 2008. Never mind that self appointed Tea Party candidate Jack Davis (who previously ran as a Democrat) using $3million of his own money siphoned off 9% of the vote. Never mind that Democrats poured millions into this small election and totally demagogued the Ryan Budget. One ad this special election cycle was as ugly as anything aired in recent years, portraying a Paul Ryan stand-in literally pushing Grandma off a cliff. Democrats laughed it off as hardball politics with a sense of humor, ( where’s Media Matters when it matters)but they wouldn’t have been laughing if Republicans ran the ad against one of their own. Take a look at the headline and comments from the Think Progress Web site. Headline: Democrat Kathy Hochul Beats Republican Jane Corwin in New York’s 26th District “Viewed as a referendum on House Budget Chairman Paul Ryan’s plan to end Medicare, Hochul’s victory exemplifies the American public’s overwhelming disgust with the GOP push to force seniors to bear the burden of increasing health costs. But DCCC chairman Rep. Steve Israel (D-NY) outlined the three reasons that Corwin lost the election: “[I]n alphabetical order, Medicare, Medicare and Medicare.” Despite Corwin indeed crumbled as a result of the American public’s disillusionment with the GOP agenda. And now, Hochul becomes the fourth Democrat to represent the district since 1857. “And this is only the first seat,” said Israel. Do these people need to be medicated or what? When Barack Obama replaced George Bush, there was unbridled joy among the elites. The days of “cowboy diplomacy” were over! Finally, we had a president who was a careful multi-lateralist who wouldn’t rudely impose his will, but would instead work with allies to build consensus. But that’s not what Obama delivered with Israel last week, is it? Obama went to the State Department put his full diplomatic skills on display and insisted Israel needed to stop its “unsustainable” policy toward the Palestinians and “boldly” retreat behind pre-1967 borders. 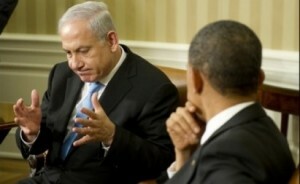 A stunned Benjamin Netanyahu responded as any ally would if so roundly betrayed. He publicly — correctly — denounced Obama’s policy prescription. Then all hell broke loose on the left. Israel, a socialist democratic country and our strongest ally in the Middle East came under enormous fire from all sides on the left. In reading all of the attack articles and comments it appears to me that leftists were enraged that a member of the Israeli right wing Likud Party (let’s remember he was democratically elected) had the audacity to lecture and correct our thin skinned President who does not suffer criticism lightly and has yet to articulate any coherent policy in the Middle East. How about a gigantic middle finger, Benny? And 0, that is ZERO money, null, nil, nada nuttin in aid. Comment 2: “I agree with you. Israelis have universal health care thanks to our financial assistance. We should stop sending a single dime to Israel until we have universal health care for all Americans right here at home. Comment 3: “Israel, if you want people to stop hating you, then stop doing things that people hate. “BOLTON: He’s flatly wrong on that. If you go back to foundation of the UN Security Council Resolution 242 after the 1967 Arab-Israeli war, that resolution calls for all states in the region to live in peace within secure and recognized boundaries. It doesn’t say anything about the 67 line or anything else. And I think that’s a key point here. That 67 line was a 1949 Armistice line. It simply reflects where the Israeli and Arab armies ended up the conflict. There’s another armistice line too, the 1973 Armistice line, which is Israel’s greatest extent of control. If you’re going to start with any line, why not start with that line. Herein lays the problem. The resolution states “from territories” not “from the territories”. This nuance in language was fought for and won by the U.S. during the UN session on the resolution. Not a single President since then has re-inserted the “the” in the language except for Barack Obama. Middle East politics are filled with parsing and nuances and President Obama should have known better. I’ll take the word of former US Ambassador to the UN John Bolton over Think Progress writer Ben Armbruster. I shot the sherrif....but I did not shoot the deputy ! Two years ago, I publicly committed to a solution of two states for two peoples: A Palestinian state alongside a Jewish state. 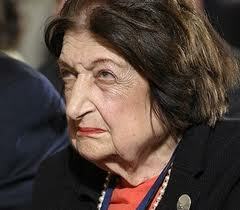 Comment 3: “I’m infuriated that those AIPAC members in the audience physically attacked this woman. The police then “dragged” her out and took her to the hospital for treatment of the injuries she received to her neck and shoulders as a result–and of course, SHE was arrested. I’d like to know why those AIPAC goons haven’t been charged with assault and battery–they had absolutely no right and no legal authority to engage in that kind of violent behavior towards a citizen protester. And our Congress gave Netanyahu a standing ovation for his response about “free societies” allowing protesters to speak out?!? Something’s seriously wrong in DC, folks!! 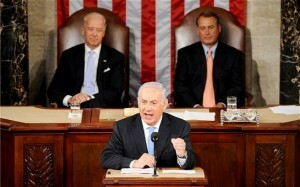 “Today, Israeli Prime Minister Benjamin Netanyahu spoke before the U.S. Congress. Despite once again rebuking the long-standing U.S. policy that Israel should withdraw to the 1967 borders with mutally agreed land swaps, Netanyahu was repeatedly applauded by Members of Congress (even moreso than Obama). 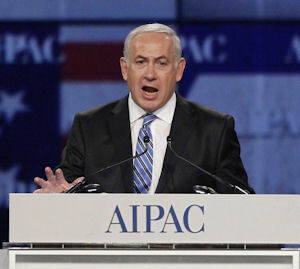 One reason the Israeli government has been able to secure such steady support for its policies, even when they conflict with U.S. policies, is due to the efforts of American Israeli Political Action Committee (AIPAC). AIPAC’s lobbying network is considered one of the nation’s finest, and every year it holds an annual convention in Washington, D.C. that is heavily attended by members of Congress, usually drawing at least half of the members of the Senate, for example.”……. Nonpartisan? Advancement of ideas and policies? You decide. This entry was posted on May 26, 2011 at 1:43 pm. You can follow any responses to this entry through the RSS 2.0 feed. Both comments and pings are currently closed. 1 Response to "Progressive Report….Forget the Greek and Spanish vacations…and stay away from Israel!"